Well I found out that May is not the last Carroll Cafe! There will be one more for the season on June 13th! So you’re in luck if you still haven’t made it out to one! This salad is the savory option I served for May’s Carroll Cafe. I loved this salad. As I was making it I just kept on thinking of other things I wanted to add to it so that by the end it was pretty evenly split between quinoa and vegetables. Quinoa is a type of seed, and is a complete protein so it’s a great option for anyone trying to eat less meat. I combined with a bunch of bright, crunchy vegetables, as well as some roasted veggies to add some sweetness. This salad has a lot going on but it all works so nicely together. It’s also quick and easy to throw together and can easily be adjusted based on your tastes and what you have on hand. If you’re not planning on eating all of this the first day, I’d recommend making extra vinaigrette. After sitting in the fridge the flavors mellow out and you might want to add a bit more dressing to the leftovers. I also think the leftovers would be great served over a bed of lettuce (for even more vegetable consumption) and a little extra vinaigrette would be nice for that too. In a small pot combine the quinoa, water, 1/2 tsp salt, 1/2 tsp cumin, and bring to a boil. Once boiling, reduce heat and simmer covered for about 20 minutes or until all the liquid has been absorbed. 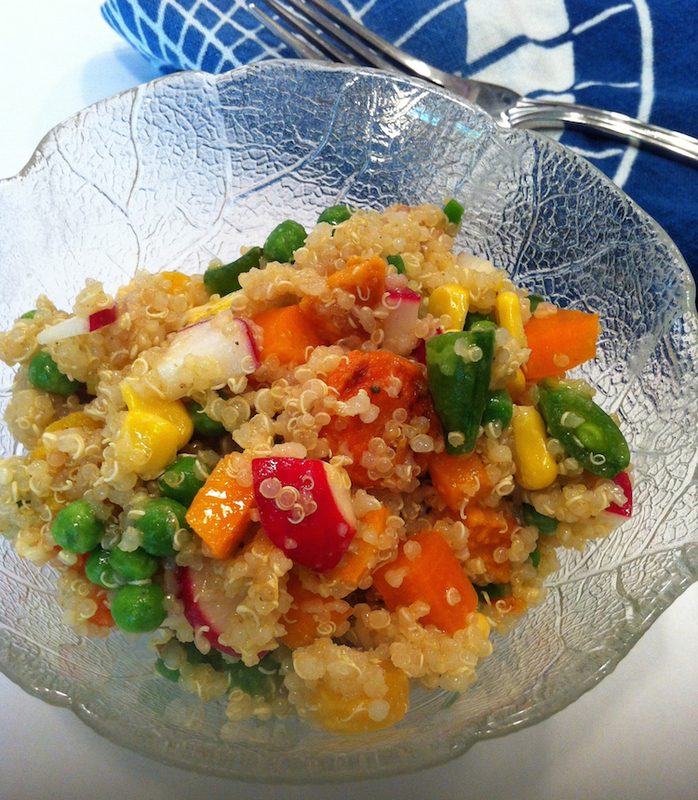 Remove quinoa from the heat and allow to come to room temperature. Preheat oven to 400°F, and spray a baking sheet with cooking spray. Toss carrots and sweet potato with olive oil, 1/2 tsp salt and 1/2 tsp cumin and spread in an even layer on the baking sheet. Bake for about 15-20 minutes, or until tender and beginning to brown, tossing halfway through. In a large bowl, combine all the salad ingredients and toss well. Add dressing as desired before serving. This salad was terrific. I believe I have some leftovers and cannot wait to have this for dinner! Thanks, Lauren. I am definitely going to try this!